We do web design, coding, SEO, pay-per-click ads, and other services focused around optimizing your website and digital presence to catalyze growth for your company in the Japanese market. Whether Japan is the next stop on your global takeover, or it’s the starting point, our goal is to elevate your brand to success. Please feel free to ask us about them. Humble Bunny was contrived and imagined in 2009 as an entity with a slightly different view on the role and importance of graphic design and digital marketing: that helping others find success is the key to finding your own. Our founder, Nate, has loved drawing and doodling since he was just a little guy. 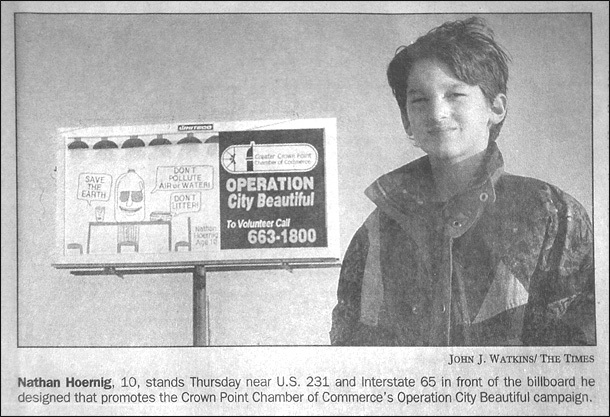 After entering a “Save the Environment” drawing contest and having his own design displayed on a road-side billboard at the age of 10, he realized how he can use his creative skills to connect with others and provide a positive experience for those around him. Thousands of people saw my message and (hopefully) experienced a moment of influenced contemplation. At ten years old, I couldn’t really understand the relevance but over the next few years, it came to me. I realized I could design something and affect the lives of potentially infinite people—I could instill thought, provoke emotion and maybe even have a positive influence on those around me. All that from a little sketch drawn on the kitchen table at age 10! The ethos of that experience lives on in Humble Bunny’s values every day. We use our skills to help companies and individuals communicate, grow, and find success. We also feel incredibly fortunate to be living Japan, a culturally rich country filled with beauty in design and communication of unspoken meaning. Our goal is to help Japan to reach out across the world, and the world to connect with Japan, through the power of design and communication.